In the first section, while consumed with the search of his mother, Molloy lost everything. Moran takes over in the second half, describing his hunt for Molloy. Within this simple outline, spoken in the first person, is a remarkable story, raising the questions of being and aloneness that marks so much of Beckett's work, but is richly comic as well. Beautifully written, it is one of the masterpieces of Irish literature. If you haven't read, heard, or seen Waiting for Godot, do so now. Then return to this additional masterpiece by Samuel Beckett. This is the stripped-down, minimalist story of one man, aged and deteriorating and bitter, but frank beyond what many people would find acceptable -- certainly this is not someone you would want to hang out with. No one can truly follow in the footsteps of Beckett in creating this kind of character and spare yet eloquent prose. There are two narrators of this book, and the first one, who is the voice of Molloy, is the best to render Molloy's music. Molloy is the first book in a trilogy, and the second has just been realeased on Audible format. I finally figured out the (perhaps obvious) significance of the three titles. In the first the main character's name is Molloy, though he sometimes forgets it. In the second the main character is named Malone, which seems to me to be basically the name of the same character, though his name has evolved. And the third, The Unnameable, is the last evolution, where the name has evolved into dust. I think that some people will just hate this book, but if it reaches you, it will reach to your core. There were points in this narrative when I was laughing hysterically, and some when I was disgusted and filled with utter pity for our sad little man, Molloy. Beckett is unlike anybody I can think of: hilarious, disturbing, and somehow smooth all the while. I'll definitely be listening again and again to this one. The narrator Barrett does an excellent job in this and other recordings. I got this because it sounded challenging. I couldn't stop listening. I was inspired by the loose ends. Utter audio bliss. Caveat lector or caveat auditor, Samuel Beckett is an acquired taste, like escargot, cuisses de grenouille, or foie gras. If you are not familiar with the theater of the absurd, or the inexplicable and haunting mysteries of life’s angst and anguish, then you will not enjoy these stories or vignettes in the form of stream of consciousness of which Beckett was not only a Genius, but an adept Master. These are autobiographical fictional stories of Nothing but pure life in all its vicissitudes floating in and out of first, second, and third person. Bits of life full of tragedy mixed with comedy that will horrify and in an instant make you laugh at our genuine absurdity as we strive for purpose and the search for personal meaning in what seems to be a cold, irrational, and indifferent world. 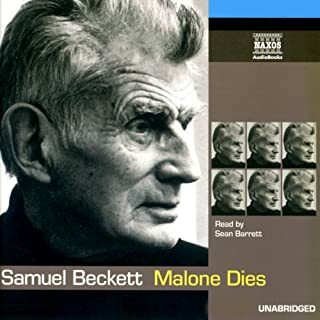 Beckett is one of my favorite writers and this trilogy of Malloy, Malone Dies, and the Unnameable is my most cherished. 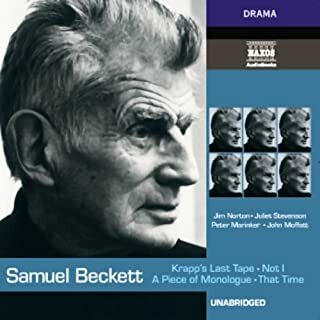 The narration is superb, sublime, and acted out in a dramatic fashion like many of Beckett’s plays, which makes the character studies seem more than life like. 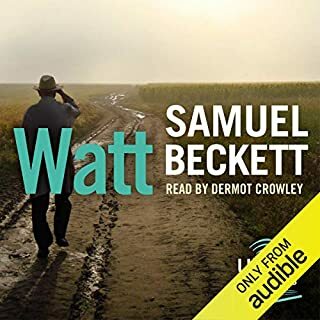 I only wish audible would continue to produce more of Beckett’s short stories with Sean Barrett and Dermot Crowley, these two great actors! Bravo and Kudos!! Beckett makes a mockery of meaning, while being able to explore it in ways both enlightening and comical. This is a very interesting novel and I am looking forward to starting the next in the trilogy. I am revisiting Molloy after about 30 years since I first read it and I am amazed by the freshness of Beckett's writing. (Not surprised, as he's one of my favorites, but amazed). It meanders with such intelligence as to be instructive. The readers are really top notch, perfect at conveying the nuanced meaning in the work. If you like Beckett, by all means, pick this one up! Not the narrators' fault, though. Thr source material isn't best for audiobook format, but still engaging. "Not to want to say, not to know what you want to say, not to be able to say what you think you want to say, and never to stop saying, or hardly ever, that is the thing to keep in mind, even in the heat of composition." I'm ever so confounded by Beckett. Eluded even. His plays remain impenetrable for the time being, and from among the celebrated novels, "Malone Dies" (1951) and "The Unnamable" (1953), are closed books to me. But "Molloy" (1951) is something different altogether. It's easier to appreciate, to get into, and ultimately, enjoy the ride for as long as it goes on. 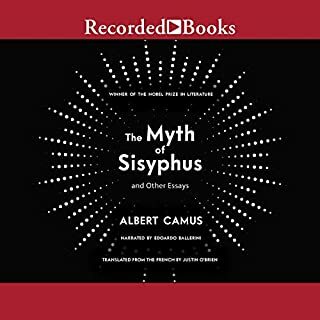 It is profound, full of actual wisdom instead of mere philosophizing for the narrative's sake, and what might make it difficult is also its greatest strength: its otherworldly slumbering from nowhere to anywhere, and/or vice versa. In short, it draws attention to the act of stopping by coming to a halt itself. What it shares with Joyce is its method of existing in the moment, not before nor after, but in the very moment it is read, as if reading it somehow conjured the words onto the page. Much of the praises in this review go to Sean Barrett, whose second nature it seems to be to interpret great authors and make it seem like he himself wrote the darn things. He's that good, and he's in his element with Beckett. Dermot Crowley, responsible for the other half, is great, as well, although it takes some to get used to the change. 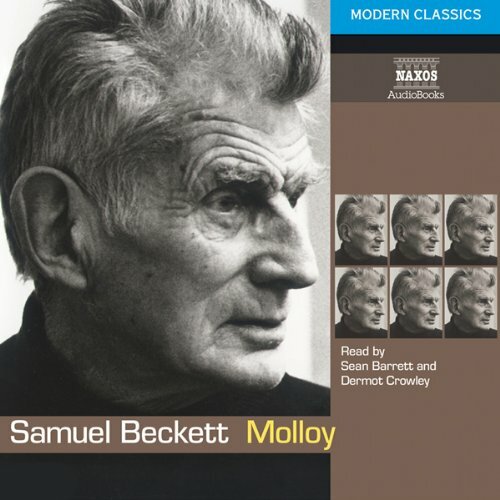 Perhaps I had all I needed with "Molloy", since "Malone Dies" felt quite impossible to see through, but this one is a book I really like, yet I'm perfectly set on revisiting Beckett in the near future. I have a feeling that one day, all will be revealed, all that at this time doesn't quite seem to add up. In the meantime, I'll keep on standing on the seaside, sucking those stones. Just let me get my greatcoat. Here's a writer, playwright, persona who when first encountered in youth and vitality represents a brick wall of intractability that is the gold-standard for cool. Later life and experience, the erosion of disappointments, missed opportunities and passed chances brings Beckett back into play with the mask finally taken off. And it is wonderful, funny and life affirming to know that this little Irish guy with the furrowed face has been there before you and seen it all and written it all - yet still doesn't have any of the answers you are looking for. Mal-alloy a bad mix - but nothing bad about this one. We are lucky to have Beckett's work on stage, on screen on download - it never fails to reach out and hold you with its power, simplicity and truth. What made the experience of listening to Molloy the most enjoyable? I feel beckett's work lends itself more to being heard with the ears than being read with the eyes. Both Narrators were incredibly expressive, which must have been difficult, since Beckett doesn't give much to work with by way of characterising. So much is left to the listeners interpretation. That this question is here shows that this little review sheet was not made especially for this book. However without spoiling anything I will say Moran from the second half of the book. It's a much more difficult part to read, and the story becomes rather interesting at that point. the part of the book where molloy agonises over the problem of too many 'sucking stones'. There's beckett for you right there. massive amounts of time spent on a tedious problem that should be a non-event - ie the problem of having too many stones against too few pockets. It made me laugh and despair all at once. Honestly, I wouldn't. this wouldn't lend itself to film. I will be honest. Samuel Beckett's work is dificult going, but these wonderful audio versions make it just that little bit easier. It's well worth the effort if you're willing to stick with it though for Beckett's commentary on the human condition. This is an extremely complex book and I found it hard to just listen. Would recommend reading it, instead of listening. As context becomes more accessible when one reads it. This was my first Beckett novel. Truly spectacular with many deep and psychological themes. Would recommend this to anyone and everyone. Great performance but the story became tedious. Yes and no. I have seen one or two Beckett plays and thought I liked his language. However, it turns out that what works in a play doesn't necessarily work for the duration of a novel. Finding this out was time well spent but that was the only reason. What could Samuel Beckett have done to make this a more enjoyable book for you? He could have made it less of an amorphous blob and structured it. That is probably very hard when you are writing a stream of conscious novel and asking me what a man of Beckett's stature could have done better is like asking me what is wrong with Tiger Woods' swing. It's just that after the first 30 minutes this wasn't the book I wanted to listen to any more. Which character – as performed by Sean Barrett and Dermot Crowley – was your favourite? I have to confess that I only made it about 90 minutes in so was not aware that there were two narrators. However, the narrator that I heard was absolutely brilliant. It was on the strength of the sample 5 minutes that I bought the book. The narrator had a beautiful lilting Irish accent which I could have listened to all day. Could you see Molloy being made into a movie or a TV series? Who would the stars be? No. It would require an even greater chunk given over to interior monologue. This worked in Reginald Perrin but I think it would become too much with so little actually happening. The stars? Maybe a younger Wilfred Bramble or David Kelly.